Our old friends Joe Pickett and Nick Prueher are devoted to bringing more of the good kind of weird into the world, whether that’s in the form of their work on the Found Footage Festival—finding the weirdest VHS tapes in existence and bringing them to a wider audience—or with a periodic series of morning news pranks that’s seen them get “troubled yo-yo experts” and clearly incompetent Thanksgiving chefs onto the air. 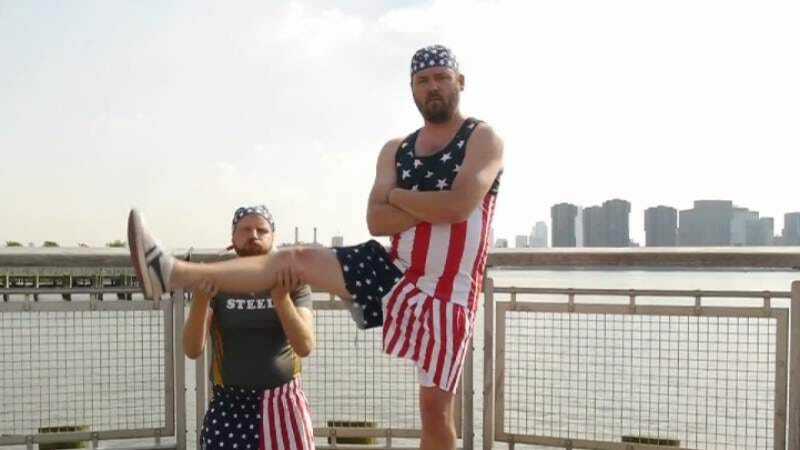 Unfortunately, the pair’s latest news stunt has finally drawn the ire of a big corporation, with TV conglomerate Gray Television suing the duo for “copyright infringement, fraud, and conspiracy” after they posted videos of themselves appearing on the company’s stations as decidedly unimpressive inspirational strongman duo Chop And Steele. Chop & Steele Need Your Help! from Found Footage Festival on Vimeo. Apparently irritated by the sight of its anchors ooh-ing and ahh-ing while Pickett and Prueher stomped wicker baskets and broke thin sticks over their knees, Gray Television slapped the pair with a lawsuit. Picket and Prueher have decided to fight the charges, citing fair use and hiring a lawyer with the very legal name of Anderson Duff to represent them. Courtrooms are expensive, though, which is why Chop And Steele are asking fans to help support them in their ongoing quest to remind morning news talent bookers to fact-check guests at least a little. If you want to help out, Pickett and Prueher have set up a GoFundMe to cover the expected $80,000 in legal fees for the case. They also promise to give any extra money to the ACLU, and that, once this is all resolved, they’ll continue to appear on news shows, possibly as jugglers (or “maybe in the form of incompetent cat trainers, we’ll see”).